Coming Soon! New Rabbit Monoclonal Antibodies! 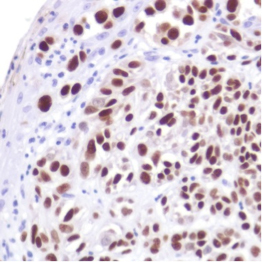 Spring Bioscience is about to release two new rabbit monoclonal antibodies: SOX-10 (SP267) and PD-1/CD279 (SP269). These highly sensitive and specific Research Use Only (RUO) antibodies are specially engineered for your tissue based research. - SOX-10 (SP267): SOX-10 is a member of the SOX (SRY-related HMG-box) family of transcription factors involved in the regulation of embryonic development and in the determination of the cell fate. SOX-10 is predominantly found in oligodendrocytes, peripheral glial cells, melanocytes and adult neural crest stem cell populations. SOX-10 is up-regulated in melanoma, glioma, Schwannoma, neurofibroma, pheochromocytoma, and lung carcinoid tumor. 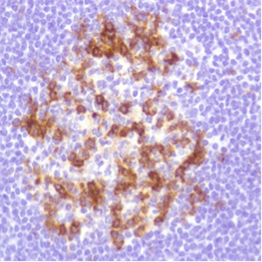 - PD-1/CD279 (SP269): Programmed cell death protein 1 (PD-1), as known as CD279, is a member of CD28/CTLA-4 family of T cell regulators. It is expressed on the surface of activated T cells, B cells, and macrophages as a negative regulator for immune responses. The binding of PD-1 with its ligands PDL1 and PDL2 on T cells, monocytes, and some tumor cells can trigger inhibition of T-cell function. To order or request more information about the new rabbit monoclonal antibodies, visitspringbio.com or call (800) 787-6896 or (925) 474-8440. Orders can also be submitted via e-mail at spring.orders@ventana.roche.com. Technical details are available through spring.tech@ventana.roche.com. © 2014 Spring Biosciences, Inc. All trademarks are the property of their respective owners.